Tag line: "Close Your Eyes. Say Your Prayers. 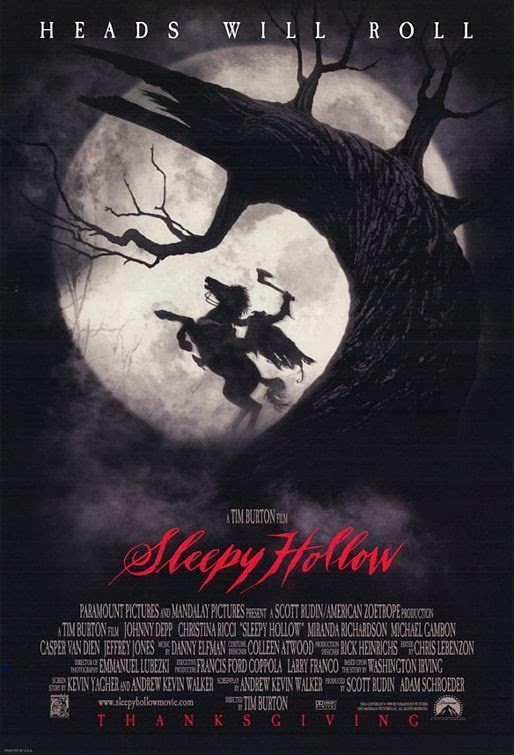 Sleep If You Can"
Based on Washington Irving’s 1820 short story The Legend of Sleepy Hollow, Tim Burton’s Sleepy Hollow is a visual treat, supported at all times by its very impressive cast. The year is 1799. Ichabod Crane (Johnny Depp), a constable in New York City, insists that modern methods of crime detection should replace the archaic techniques currently employed by the police. As a way of testing his theories, the Burgomaster (Christopher Lee) assigns Crane to investigate a series of murders in the upstate farming community of Sleepy Hollow, where three people have had their heads lopped off. But when he arrives there, Crane finds a local population that believes these killings were the work of a Headless Horseman, a former Hessian soldier (Christopher Walken) who’s returned from the grave to search for his head. With the help of Katrina (Christina Ricci), daughter of Baltus Van Tassel (Michael Gambon), the richest man in town, Crane attempts to prove that there's nothing supernatural about this case, only to discover some legends are, in fact, very real. As he did in both Burton’s Edward Scissorhands and Ed Wood, Johnny Depp delivers a strong, if somewhat odd performance as Ichabod Crane, a hero not by choice, but by circumstance. As the only lawman in town, his Ichabod Crane must appear to be in complete control of every situation, even if what he discovers scares the living hell out of him. His first night in Sleepy Hollow, Crane meets with all the town elders: the Pastor (Jeffrey Jones), the magistrate (Richard Griffiths), the notary (Michael Gough), the doctor (Ian McDiarmid), and Van Tassel himself. When Van Tassel tells him the story of the Headless Horseman (which includes a pretty sharp flashback sequence), a clearly shaken Crane tries to remain calm, despite being frightened out of his wits. Later on, while walking with the Magistrate, Crane has his first encounter with the horseman, and it’s more than he can stand (he faints straightaway). Depp does a fine job conveying his character's fear while at the same time always pressing on, determined to solve this case no matter where it leads him. The unique look that Burton brought to Beetlejuice, Edward Scissorhands and the Batman films is again on display in Sleepy Hollow. The town itself is a dark, gothic place, where the sun never shines and a mysterious fog emanates from every corner. At times, Burton’s singular vision is used to get a few laughs; Crane’s first encounter with the "Headless Horseman", who’s actually Brom Van Brunt (Casper Van Dien) in disguise, ends with the constable getting a fiery pumpkin thrown at his head. But the serious elements of the story, like the flashbacks to Crane’s childhood, also fit neatly into the world Burton and his team created for the film. In the end, Burton’s somewhat twisted imagination proved the perfect match for Irving’s short story, and with a little help from his cast, he managed to bring it convincingly to life. I liked the Hessian before he got his head chopped off. Other than that...meh.